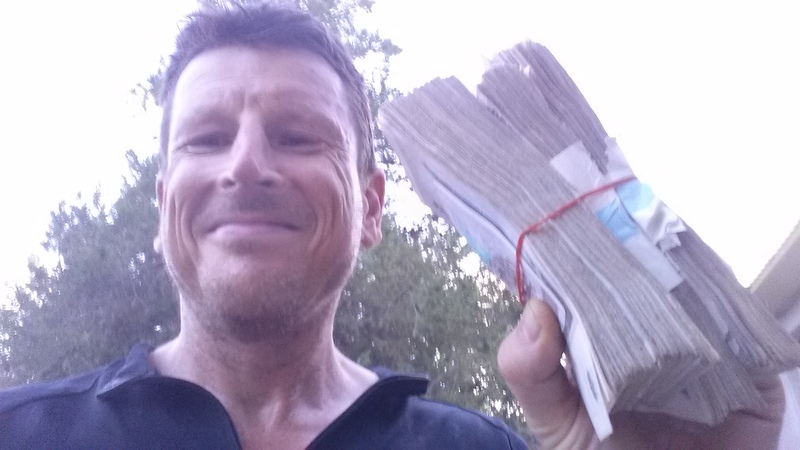 I am lying in my hotel in Uzbekistan with my wheelbarrow of money, exhausted. Not from today, but from the Turkmenistan dash. A 70km ride into the wind with lots of stops meant today was a slow down from the last days, and got us to within a bull’s roar of Burkhara. The border crossing was harmless. After our horror Iranian border crossing, we went expecting the worst, and were greeted with smiles and efficient people. Again, we were greeted by loads of people on the road. Everywhere you go, people are lovely. It’s a thing common in the world! 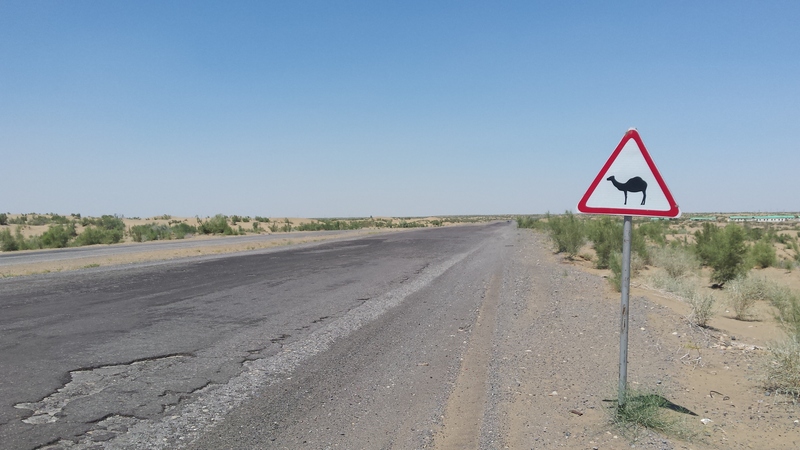 In Turkmenistan they have saved money on road signs. I think I saw about 2 road signs showing directions in the whole country. Crossing into Uzbekistan, we passed a cool one. Exotic places so close! 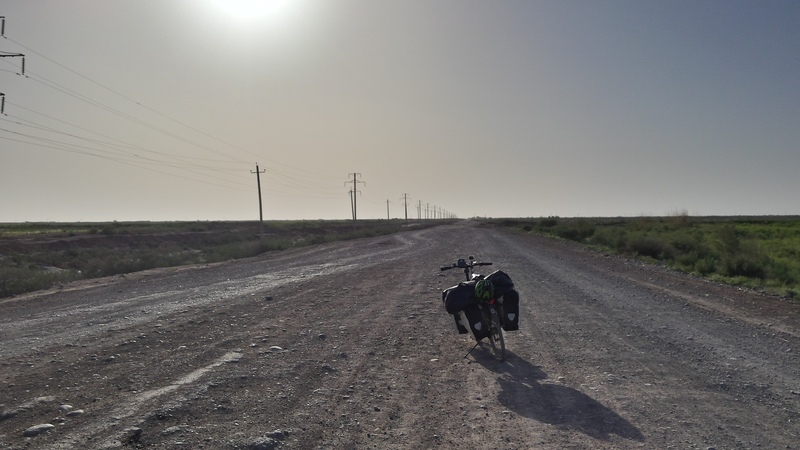 I have almost cycled across Turkmenistan in 3 days – just 40km tomorrow to the border. Today I drank 10 litres of water and 3.5 litres of soft drink. 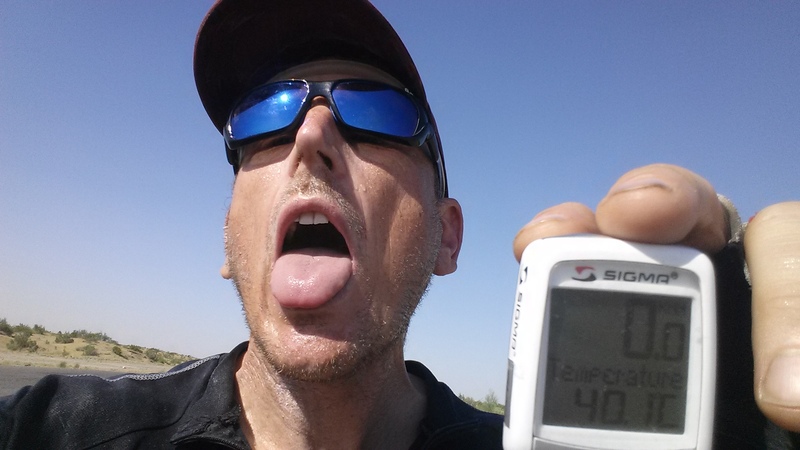 I cycled 190km through temperatures up to 41.1C, with a moderate headwind from 11 to 4 o’clock. And I met lovely people in the desert. The desert is vast, hot, and beautiful! The desert contains sand, camels, camel signs, and 12% slope signs (even though the slope would not have been more than 3%). 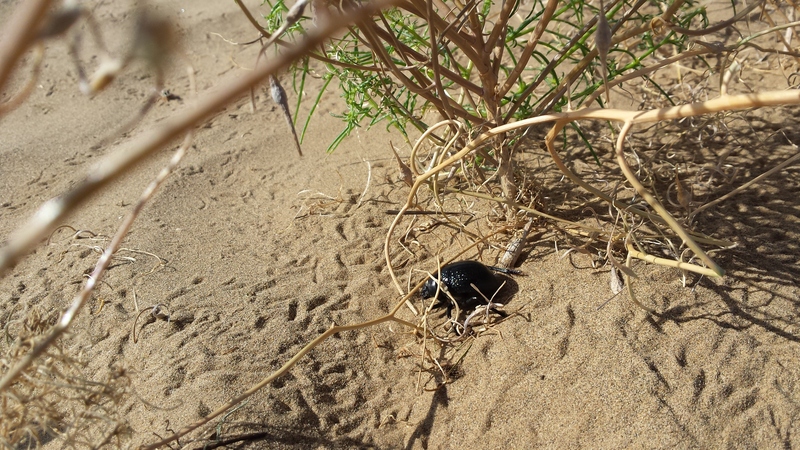 The desert also contains little cute black beetles that patrol the dunes. Their footprints criss-cross the scorching sand. 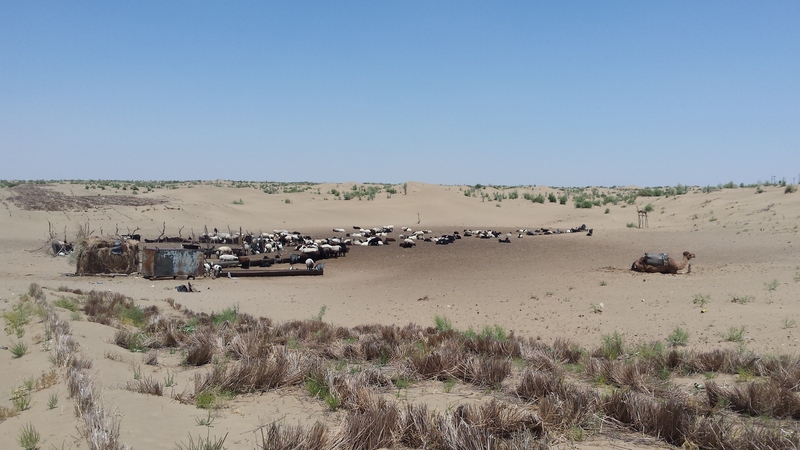 And the desert contains little villages on the train line – every 15km or so. When the heat was approaching being unbearable, I went into one of the villages and had a lovely talk with the shop owner and her children. 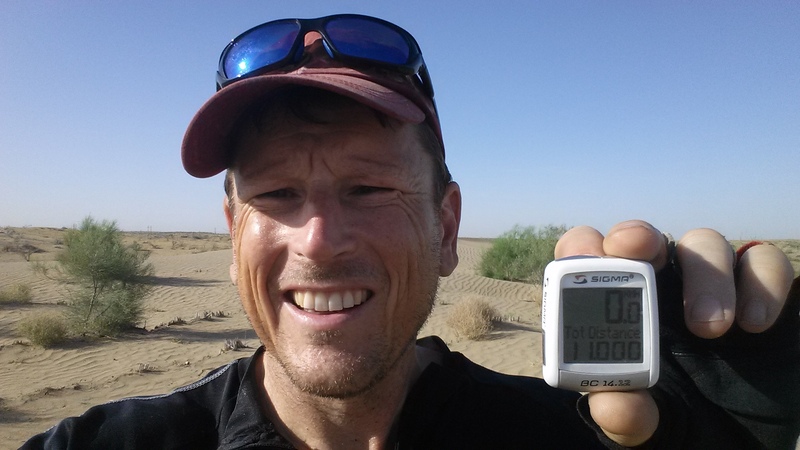 I also passed 11000km today – in the morning before the wind and the heat started. 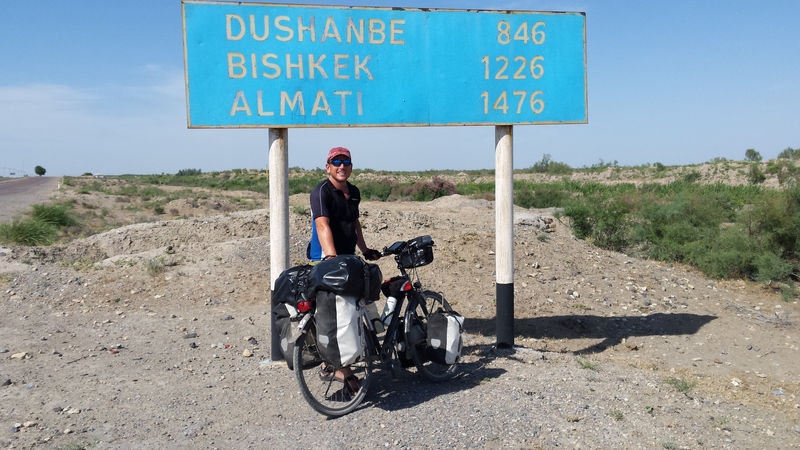 I cycled on into the evening, and arrived at a hotel in Turkmenabat, only to be called out to by Thomas. Huh? He was miles behind me. 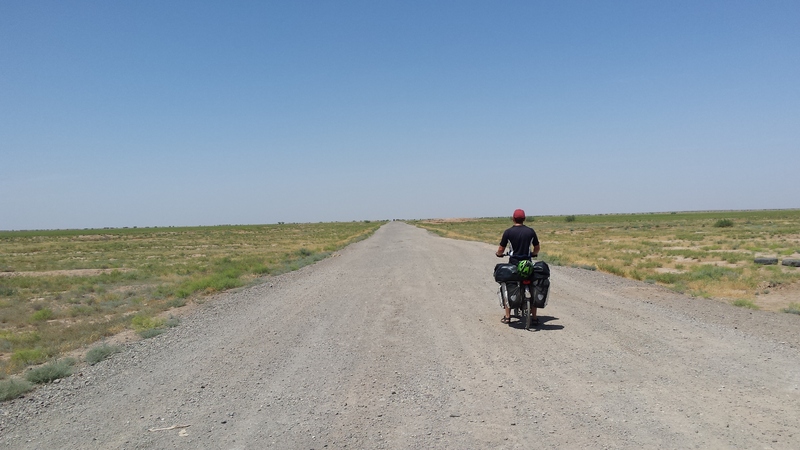 He had taken a bus 80km back as it was too hot and too far to Turkmenabat. 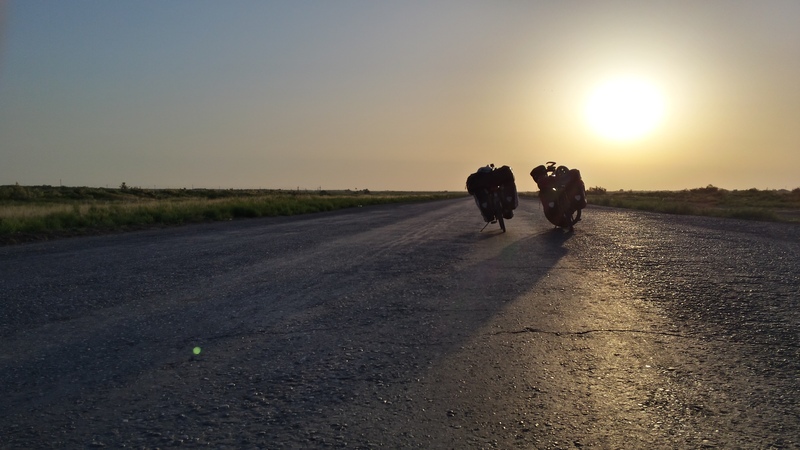 We are now all ready to leave Turkmenistan within the 4 days. I am proud to have made it. 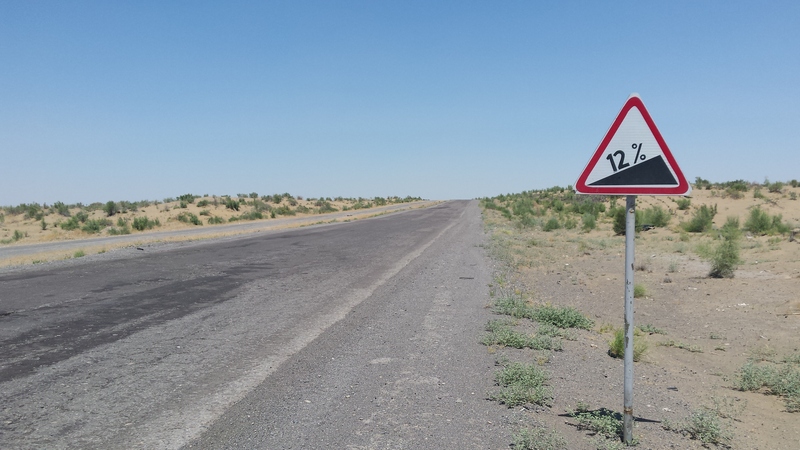 Today was the day to put the foot down on the accelerator and make some kilometres to cross Turkmenistan in four days. The wind didn’t agree with this plan, made it a long day, and meant I left Thomas who was slower in the wind. 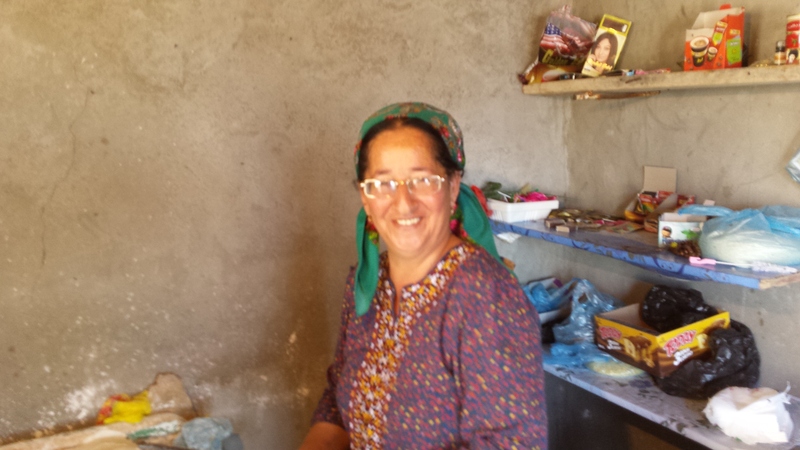 Other than cycling, I tried my hand in making Turkmenistan savoury pastries – I wasn’t too good at it. I was kind of waiting to enter the centre of the city of Mary where there were shops, people walking around, and a pleasant atmosphere. I kept on cycling on the main road, passed some big roundabouts and some impressive official buildings adorned with the president’s picture, and came out the other end. 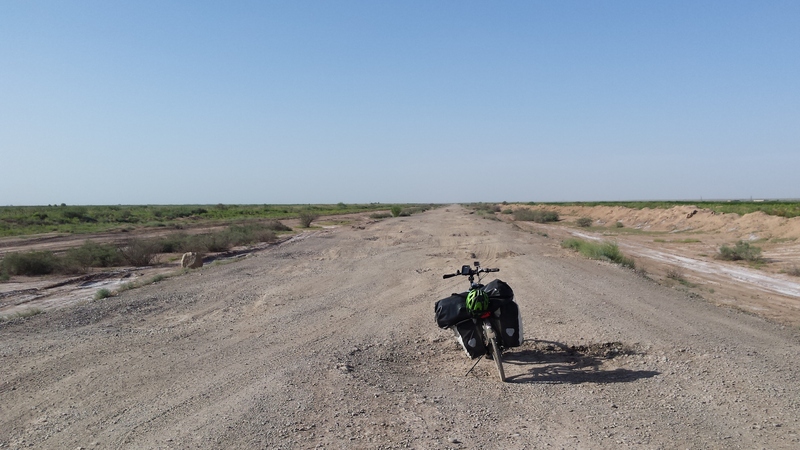 My conclusion: Turkmenistan cities are not that exciting – I much prefer the endless roads spanning the flat desolate plains. I love bleak and dry landscape. 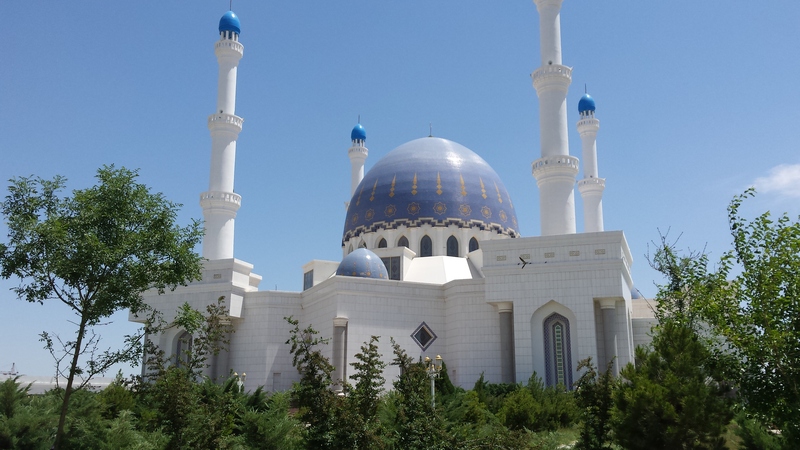 Here is a photo of the big mosque in Mary. Before Mary I stopped at a tiny shop with nothing – except some lovely people that were making lunch for their family and customers. I was allowed to try to make a savoury pastry before it was stuck to the side of a clay oven. It was fascinating to watch it being made, even if my attempt to make one was a failure. I am staying at the last café for 60km of desert. 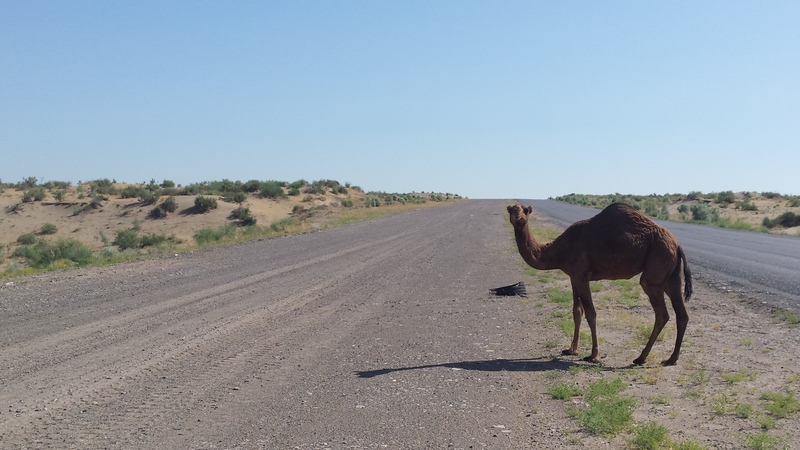 The last stretch to Turkmenabat is long, desolate, and empty. That’s for tomorrow..
P.S. I was about to go to bed and Thomas walked in to the café where I was sleeping. A big congratulation, and then he sat down to eat. 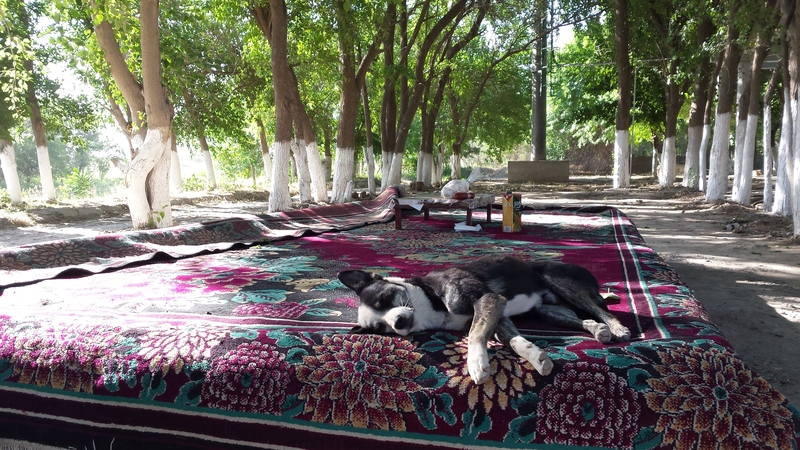 He had cycled on through the evening, and joined me for the night in Zehmet. A lizard darts across the hot, dusty road. We stop, and watch the black beetle waddle past. On either side is a flat, bare expanse – just a few shrubs dotted around, and the sun blasting down from above. Turkmenistan nature. And the people! Beautiful, friendly, and such wonderful clothes. We’ve now tasted Turkmenistan and are addicted. We greeted the same unfriendly people at the border crossing at Iran. They were surprised we were back so quickly from Mashhad. Our papers were checked, and it looked like it was going to be another long affair before they waved us through. We crossed the bridge over the wet patch in the dry earth that is the border. Our first experience with the beautiful clothes of the beautiful Turkmenistan people. A camouflage uniform with a floppy broad brimmed hat. A belt with a shiny metal buckle with the Turkmenistan stars. The women all wear a bright, colourful head scarf – such colour matches their broad smiles and the twinkle in their eyes. A small boy introduces himself in English, and asks how he can help. Everyone waves and everyone looks happy. And then an indication of the other aspect in this country – the Turkmenistan state is watching. In the evening we are taken to our hotel room / dining room and are told to not to leave it. It is a holiday, and the hotel is meant to be closed. The hall lights are off, and the water is turned off. If the police find they are open on this happy holiday, there will be ‘problem’. I know there is a language barrier, but understand the importance of keeping quiet. Who knows what is allowed and what not on this joyous occasion adorned with a holiday. A highlight of today was the cycling. The road was small, and void of people – a truck or car passes every half an hour. Stop, and the silence reigns. It was warm, and the steady side wind worked as an airconditioner. The road was often like a slalom course through the desert. Avoiding the holes called for concentration. On speaking to an Italian cyclist, we realized that the total distance to be travelled is under 500km. We’re going to try to do it – cross the country by bike in 4 days – not 5. We don’t have 5 days in our visa any more. It is going to be a real Turkmen dash. Why plan in such detail? And so far ahead? Well, that’s my ordered side. Things need to be arranged. Leave nothing to chance. And that is exactly what a trip like this can never be like.. That also makes it exciting. Still, planning can help make broad global decisions that will affect the whole trip. And it is also a lot of fun! 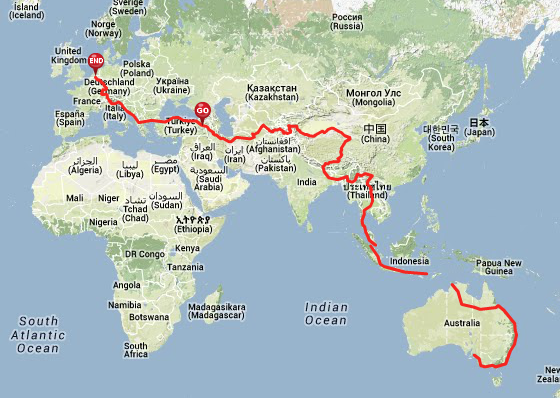 In September 2014 I will be leaving Eindhoven, the Netherlands, to cycle to Adelaide, Australia, where I was born. 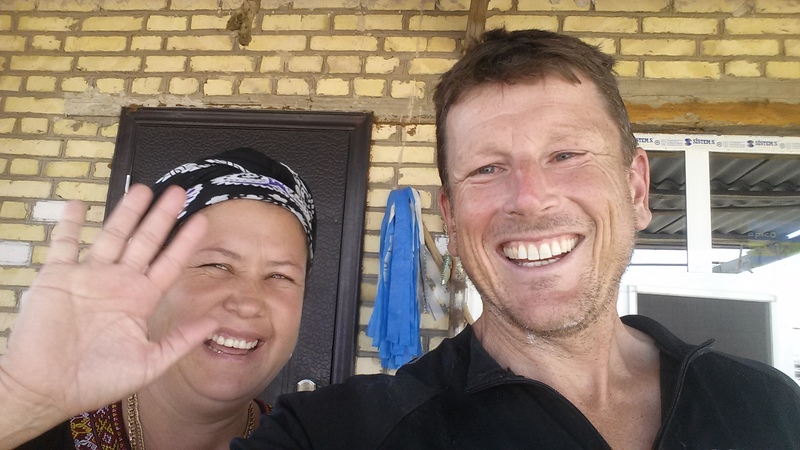 After cycling through Europe in 2014, the second stage of my trip starts in Istanbul in Turkey around March 2015, and sees me end somewhere in South-East Asia. There are lots of options, and lots of decisions to make. Here is the current planned route. At first I was a bit irritated when I discovered that, perhaps, my timing was a bit skew. I have planned too much time. 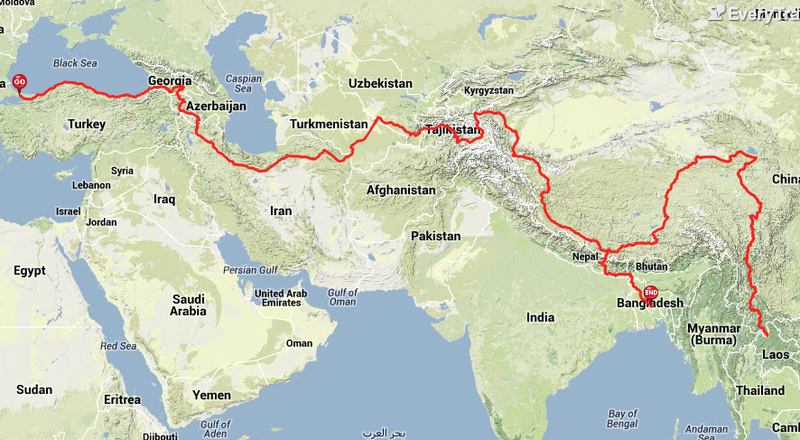 Leaving Istanbul in February/March to get to Tajikistan on June 1 where I would meet up with my cycling friend Chris. But, hey, this is a cycle trip of a lifetime. No stress. No hectic agenda. I am going to take my time and see places not many people have the privilege to see. I am going to take detours. This route is the basis. I am now collecting ideas for detours – interesting places to see and things to do! Here are the countries I will be cycling through with some thoughts on my route through them. In Turkey I might stick to the Black Sea coast and enter into Georgia, Armenia, and possibly Azerbijan. But in the correct order. The relationships between the countries in the Caucus are complex, and in researching the trip I am discovering things I never knew existed – self proclaimed countries recognised by no-one except themselves – Abkhazia and Nagorna-Karabagh. In Iran I may head south through Isfahan and Shiraz as recommended by Bernadette Speet. The major decisions that affect the global route take place in China. Strict laws in the Tibetan Autonomous Region (TAR), expensive (compulsory) tours that need to be taken there, roads blocked for tourists, length of Chinese visas, timing of wet and hot season in Bangladesh, lack of roads leading to massive detours on the Tibetan Plateau, the impossibility of crossing Myanmar. All these affect my route through China, and, inevitably, what the whole trip looks like. I would like to have a connected route entirely covered by bike – and I would like to see Bangladesh. The only option is to fly. It has been a long road to arrive at this point, but actually, the road is just starting. Its exciting beyond belief, and bloody scary too. In September I will be leaving my job of 16 years and cycling from Eindhoven, the Netherlands – where I now live, to Adelaide, Australia – my birthplace. There is a lot of preparation to be done. I need to shed all my worldly possessions, learn a bit more about bike maintenance, arrange all sorts of paperwork, and plan the route. You guys all helped me with my cycle trip in 2013 to the North Cape in Norway. You gave me great tips on my planned route, and I was able to meet up with some of you. I would like to do that here again with this more ambitious trip. Here is a rough idea of how I want to get to Adelaide. In the coming weeks I will be putting together a planned route through Europe. It would be great to get some feedback on the route – roads I should take, places I should go. This dream I had always thought would remain just a dream. It is too risky, too scary, too thrilling. My life situation is such that I can do this now. I am fit enough. I don’t want to look back on my life when on my death bed and think – I had the chance, and I let it go. A good friend of mine summed it up perfectly: Life is not a dressed rehearsal. I am going to do this!